brown girl dreaming – A Miraculous Book | What is ML Reading? I love novels in verse. One of the first I read was Locomotion by Jacqueline Woodson. Woodson’s new book, Brown Girl Dreaming, isn’t a novel in verse if you use Merriam Webster’s definition of a novel. “An invented prose narrative that is usually long and complex and deals especially with human experience through a usually connected sequence of events.” Instead, Brown Girl Dreaming is an autobiography in verse. An amazing feat! To be able to distill your life experiences into a book isn’t easy. I know. It took me three years to write my Wintergirls post, an account of one snippet of my experience with a postpartum mood disorder. It was less than one thousand words. Over one hundred and fifty interlocking poems about your life which will resonate with middle grade readers? Inconceivable! Until, I read this miraculous book. Knowing I would want to refer back to poems which touched me, I marked pages with bright blue Post-it notes. Twenty-two grace this book. I had to restrain myself from marking each page. First, a few things to know about me. I grew up in the suburbs of Atlanta, Georgia as a middle class, white girl. Born in 1972, I don’t remember MLK’s marches, Freedom Fighters or the Black Panthers; but I do remember hearing racist comments and jokes as a child. Admittedly, I did not face the challenges or heartbreak Woodson faced due to racism, family members’ serious illnesses, and experiencing death of loved ones at an age much earlier than I. However, there is one thing Jacqueline Woodson’s childhood and mine share. The love and encouragement from family, teachers, friends and friends’ parents. Some of the passages I marked resonated with me because I ate fresh vegetables from my grandparent’s garden. I’ve walked dusty red clay roads. Perfectly distills the savagery and injustice of the treatment of brown girls, boys, women and men. Woodson was raised as a Jehovah’s Witness. Several of the poems allude to this experience. Every librarian, teacher and children’s book publisher needs to read this poem titled “stevie and me.” The reasons to let children read what interest them; and the need for diversity are stated elegantly. There will likely be a riot at the American Library Association Midwinter Conference in Chicago this winter if Brown Girl Dreaming does not win the Newbery Award. If I can’t find someone to work for me October 22nd, I may riot. Jacqueline Woodson is speaking within walking distance of my house. The extra gem for me… it’s over 100 pages. For years, a teacher in the community requires her students read an autobiography of 100 pages or more. You read that correctly. An autobiography, not a biography. Finding one is like finding a needle in a haystack. Finding an interesting one… No comment. That is, until now. I’m not only recommending Brown Girl Dreaming for this assignment. I am forcing it into the hands of everyone I can. Adults and children. 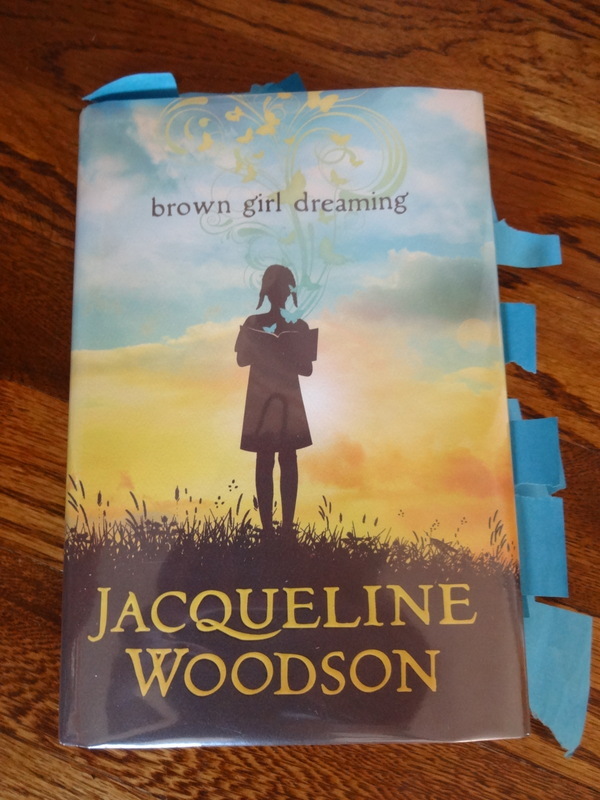 This entry was posted in Nonfiction Book and tagged brown girl dreaming, Jacqueline Woodson by mlreads. Bookmark the permalink. Kerri, I am so different! I run from novels in verse. However, this autobiography is special. I was thrilled to hear Jacqueline Woodson read excerpts when I went to BEA in New York in May, and she is so gentle and kind and brilliant. Can’t wait to see her here. So glad this book meets a need, too! I will be so very sad if I can’t find someone to work for me.